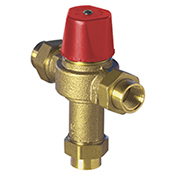 HydroGuard Lead Free* Series LFLM490 Thermostatic Tempering Valves for Hot Water Heater & Multiple Lavatory Installations. Ideal for hot water heaters and multiple lavatory installations, providing flow rates as high as 23 gallons per minute. 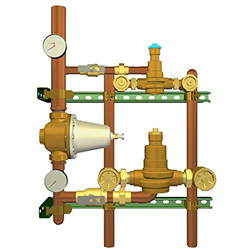 Compact design and Lead Free* brass construction simplify installation and maintenance while ensuring years of dependable service. Unique handle mechanism allows exact temperature selection to be "locked-in" for added protection. The Series LFLM490 and LFLM490-10 features Powers' advanced paraffin-based actuation technology, integral checks and inlet screens to prevent cross-flow and contamination. The thermostatic element ensures optimal, consistent performance over a wide range of temperatures. The Series LFLM490 & LFLM490-10 are ASSE 1017 listed and CSA B125 certified. HydroGuard XP Lead Free* Series LFMM430 Master Tempering Valves. Master tempering valves available in five sizes that temper water as high as 208 gpm and as low as 3 gpm. 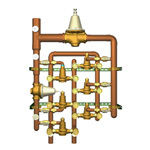 All valves are listed to ASSE 1017 and certified to CSA B125. 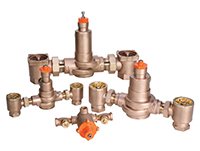 Valves feature advanced paraffin actuation technology for dynamic response and excellent low flow temperature control. The LFMM430 line also features a single-seat design for virtual shut down in the event of cold-water failure, triple-duty check stops with screens, and a 5°F (3°C) approach temperature for low temperature hot water supply. 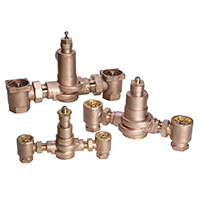 Valves are available in rough Lead Free* bronze and chrome plated finish. Single solution Hi/Lo valves available in three sizes that temper water as high as 201 gpm and as low as 1 gpm. 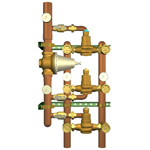 All valves are listed to ASSE 1017 and certified to CSA B125. 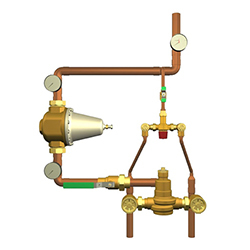 Valves feature advanced paraffin actuation technology and a booster funnel design for dynamic response and superior low flow temperature control. The LFSH1430 line also features a single-seat design for virtual shut down in the event of cold-water failure, triple-duty check stops with screens, and a 5°F (3°C) approach temperature for low temperature hot water supply. 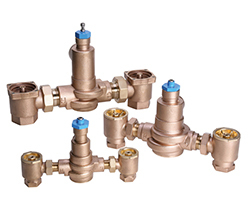 Valves are available in Lead Free* rough bronze and chrome plated finish. Powers HydroGuard XP Lead Free* multi-valve Hi/Lo Series are fully assembled, factory tested and designed to provide safe water temperature throughout commercial and institutional facilities. Each system consists of highly responsive thermostatic valves that utilize Powers advanced paraffin actuation technology. 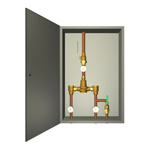 Each system includes a PRV, ball valves, pressure/temperature gauges and Powers exclusive triple-duty check stops. 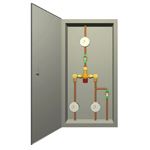 Optional equipment includes cabinets and AquaSentry2 high-temperature alarm system. 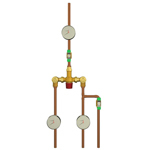 Tempering valves are listed to ASSE 1017 and CSA B125. Thermostatically blends hot and cold water to deliver tepid water to emergency fixtures, quickly compensating for temperature variations due to changes in inlet temperature or pressure. 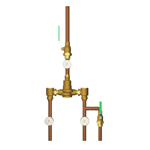 Internal bypass ensures ample cold-water flow in the event of a valve failure or loss of hot water. Choice of six cabinet options. ASSE 1071 listed. 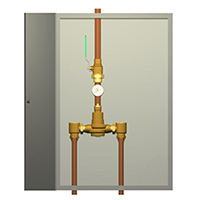 Thermostatically blends hot and cold water to deliver tepid water to emergency fixtures, quickly compensating for temperature variations due to changes in inlet temperature or pressure. 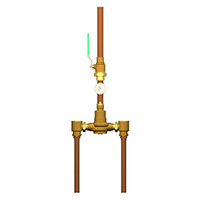 Internal bypass ensures ample cold-water flow in the event of a valve failure or loss of hot water. ASSE 1071 listed. 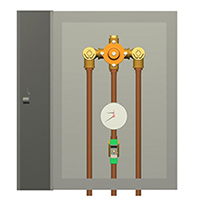 Thermostatically blends hot and cold water to deliver tepid water to emergency fixtures, quickly compensating for temperature variations due to changes in inlet temperature or pressure. 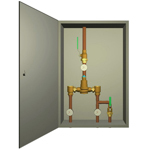 Internal bypass ensures ample cold-water flow in the event of loss of hot water. ASSE 1071 listed. Powers HydroGuard Lead Free* supply fixtures are fully assembled and factory tested. Each system is equipped with the corresponding series' thermostatic tempering valve, featuring Powers advanced paraffin actuation technology for fast response. 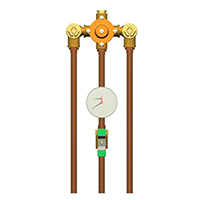 Standard features include pressure/temperature gauge, outlet ball valve and triple-duty check stops. Optional equipment includes inlet pressure/ temperature gauges, cold water by-pass and AquaSentry2 high-temperature alarm. 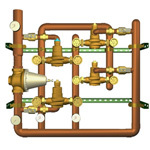 Tempering valves are listed to ASSE 1017 and CSA B125. *The wetted surface of Powers' Lead Free products contacted by consumable water contain less than one quarter of one percent (0.25%) of lead by weight.